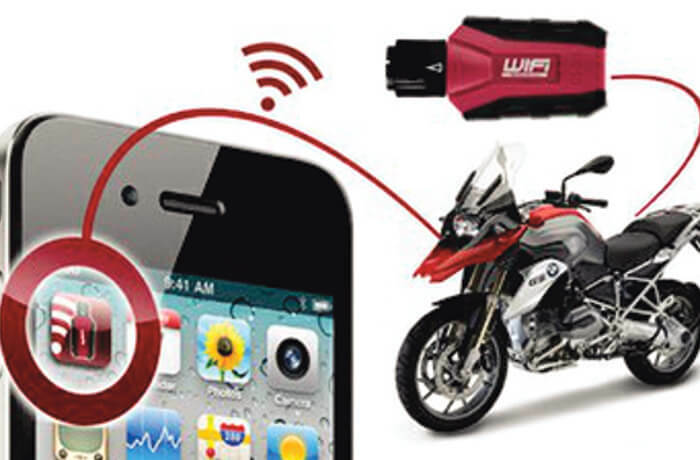 The GS-911 WiFi Professional is the new generation diagnostic tool for BMW Motorcycles. The Professional version can service an unlimited number of supported motorcycles. The GS-911 WiFi Diagnostic Tool is compatible with the latest Generation of K001 chassis BMW motorcycles (K1600GT/GTL, R1200GS LC, R1200GS Adv ALC, R1200RT LC, S1000R, C-evolution etc.) It also supports ALL the previous models of BMW motorcycles that have the round 10pin diagnostic connector due to backward compatibility. As with our previous generations, the GS-911 functionality is broken down into Emergency and Service functionality. The Windows PC software can be connected through USB or wifi and has the complete functionality. When on the road, you can connect your mobile device using wifi (the GS-911 has a Soft Access point to which any device can connect for when you are not in reach of your home/office/garage Wifi network). For the first time the GS-911 now also supports iOS mobile devices. Once the Downloader has been downloaded, open, accept and follow the steps for installation. How do I setup my GS-911 WiFi network? A quick overview of the GS-911wifi Utility for MAC & Windows PC. This utility allows you to Register your device, Configure the wifi of your GS-911wifi interface and perform Firmware updates. A short overview of the GS-911wifi Device-to-Device (D2D) mode and how it relates to infrastructure mode. In D2D mode, the GS-911wifi becomes a little wifi Access Point that your mobile device can connect to when there are no wifi networks available. Is the GS-911 WiFi the same as the GS-911 bluetooth? No. The red GS-911 wifi is a completely new product that aims to provide similar functionality to the older yellow bluetooth product while interfacing to more bikes and being accessible to more mobile platforms. The product is also compatible with the new BMW motorcycle chassis types that have a new physical layer and new protocol. The GS911 wifi can be accessed by any WiFi enabled device with a browser (e.g. smartphones and tablets) whereas the bluetooth model could not be accessed by Apple devices. The GS911wifi can still also be accessed through the PC application using the USB port. Why does the GS-911wifi infrastructure LED keep flashing red, but it never goes green? The GS-911wifi is trying to connect to a known Wifi Access points. If it cannot find a known Access point in its vicinity, it will rescan for a new list of Access points to connect to. It will keep doing this until it connects successfully or is switched to D2D Mode using the button or software. Why does the GS-911wifi infrastructure LED keep flashing green and I never hear the connection beep? The GS-911wifi is waiting to receive an IP address from a DHCP server. It is possible that the Wireless Access Point does not have DHCP activated. In such a situation, try setting a static IP instead. Why is there no configuration (gear) icon next to my access point in the network configuration list? Only access points that are currently visible and have been successfully connected to in the past, will have a configuration option. If you need to configure a network setting of an access point that you have not connected to before, add a manual entry instead. What are the red question marks on some of the web interface pages for? They provide additional information or help about the particular setting or configuration option. I have selected my distance units to be displayed as miles, yet the service reminder screen still displays in kilometres. Why? The service reminder screen will use the units that the bike’s instrument cluster uses and will therefore always override the units setting in the Options panel. Where do I find the serial checksum? The checksum is the last four letters of the serial number as displayed on the About page of the web interface or as listed by the Wifi utility under device information. Whats wrong if the GS-911 wifi is not detected by the GS-911 PC software or the PC WiFi utility? If the device status LED is flashing Red/Orange continuously, it could indicate a boot failure. If the device status LED is continuously flashing Green at 5Hz, it could indicate a boot loop. This may occur if the device was powered down during a firmware upgrade and will require firmware recovery. Close any instances of GS-911 PC Application or the PC WiFi utility that may be running. 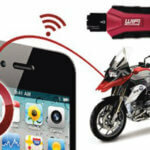 Unplug the device from the motorcycle and USB, ensuring that it is OFF. Press and hold the red button and plug the device into USB only to power it up, whilst holding the red button in. Release the red button immediately after it is powered up. Do not open the Wifi utility but right click on the WiFi utility icon in the system tray and select “Check for updates”. 7. This should start the upgrade process to recover the firmware on the device, follow all the relevant prompts and if any errors or failures occur, click “OK” and repeat the process from step 6 above, it may take several attempts. 8. Once the upgrade is completed, click “OK” then you can run GS-911 or the PC WiFi utility as per normal and reconfigure/test the device. The GS911wifi unit requires an internet connection to execute the service functions from a cloud server. When it is set up for D2D functioning, the device itself is set up as the access point and cannot have an internet connection at the same time. You have to configure the unit for Infrastructure mode so that it can connect to the internet via a Wifi access router or via a smartphone set up as an internet hotspot. Alternatively, if you do not want to be reliant on an internet connection, you can download the standalone PC application using the download utility from our download page. The PC application will enable you to perform service functions without having to have an internet connection. How do I send my GS-911 wifi debug logs? Can’t I just use my phone/tablet as a wifi Hotspot? You will have to configure your phone as a wifi hotspot with internet sharing. Many cellphone providers disable this functionality. You will have to remember or write down the SSID and password for the hostpot connection. You will then create a new connection profile for the GS-911 wifi to connect to the cellphone using the remembered SSID and password. If you are configuring this using D2D mode from the same phone, the connection profile will have to be made using the ‘Add network manually’ link and not the ‘Scan for Networks’ link. If you have an additional phone/tablet with wifi you might put the one in hotspot and use the other in D2D mode and have the GS-911 wifi scan for the hotspot SSID like it would another Wifi Router. Now the phone has to be switched from D2D mode to hotspot Infrastructure and simultaneously the GS-911 wifi has to be switched from D2D to Infrastructure. This can be achieved using the toggle button. Using the PC Wifi Utility with the USB cable to monitor the switchover on the GS-911 wifi device, might prove helpful especially if it has more than one wifi access point it could connect to. You may try to disable other configured Access points or forgetting/deleting the alternative network configurations. Also keep in mind that cellphone data connections can dynamically degrade to very low bandwidth (GPRS, EDGE) and communication to the Cloud Server might become slow and jittery.